A number of frosting recipes call for egg whites as a primary ingredient. Royal icing, for example, is a type of egg white frosting made from egg whites, powdered sugar and cream of tartar. It's a stiff frosting that dries hard and is ideal for making designs on sugar cookies. 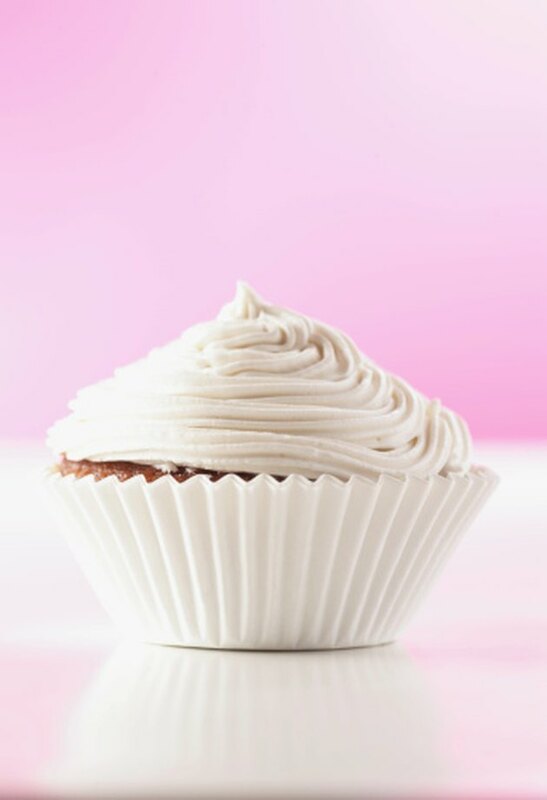 You can also make a soft, fluffy, egg-white frosting more suitable for cakes and cupcakes. Seven-minute frosting — so named because it takes approximately seven minutes to whip the ingredients into frosting — is a quick, fresh alternative to store-bought icing. Crack an egg firmly against the counter top. Hold it over the bowl, gently opening it at the crack to allow the white to spill out while containing the yolk inside. Pass the yolk back and forth between the two halves until all of the egg white has poured out. Repeat with the remaining eggs. Save or discard the yolks. Bring about an inch of water to a boil in the base of the double boiler, then reduce it to a simmer. Place the egg whites, sugar, salt and corn syrup in the top of the double boiler. Set it over the simmering water. Beat the ingredients over the water for about seven minutes with the hand mixer set to high speed. The mixture should become thick and fluffy with soft peaks. Remove the top of the double boiler from its base and set it on the counter top. Add vanilla extract. Continue to beat the frosting until it's stiff enough to spread. The recipe makes about five cups, or enough to frost a single layer, 10-inch cake. Eggs are easier to separate when they’re cold. Allow them to come to room temperature after separating them before you combine them with the other ingredients. If you don’t have a double boiler, you can use a saucepan and a bowl, as long as the bottom of the bowl doesn’t touch the simmering water. Seven-minute frosting tends to become granular if it sits for longer than a day. For best results, make it after your cake or cupcakes are cool and ready to be iced — preferably, just before serving.